The Swedish Chamber of Commerce for the Netherlands in co-operation with Business Sweden and the Embassy of Sweden is very proud to present the Swedish Chamber Business Awards 2018. The Swedish Chamber Business Awards Aims to strengthen the Swedish-Dutch business relations and are awarded to Swedish companies in the Netherlands. Welcome to nominate your own company or another company you would like to recommend, by filling in the application form. 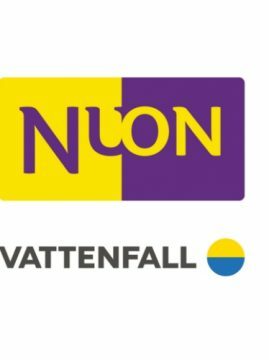 The Exclusive Award Ceremonies will take place at the Swedish Chamber Christmas Dinner on December 14, 2018, at NH Collection Barbizon Palace Hotel Amsterdam. 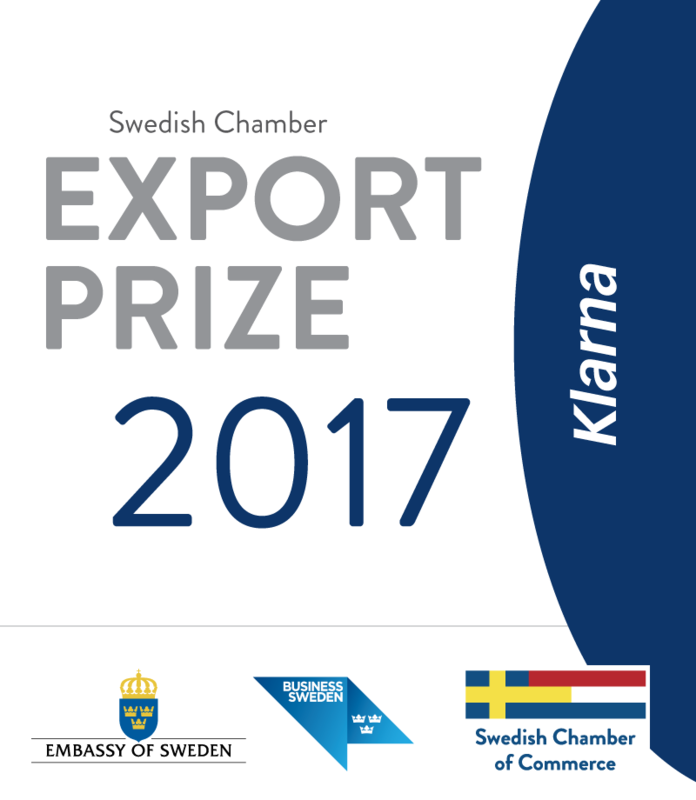 The Swedish Chamber of Commerce for the Netherlands, The Embassy of Sweden and Business Sweden were very proud to reward the Swedish Chamber Export Prize 2017, on December 15, 2017 to Klarna B.V. The prize was handed out by H.E Ambassador of Sweden Mr. Per Holmström to Mr. Robert Bueninck, General Manager, Klarna Nederland. The Swedish Chamber Export Prize aims to strengthen the Swedish Dutch business relations and has been awarded since 2012 to Swedish related companies in the Netherlands. Klarna B.V represented in the Netherlands has been awarded the Swedish Chamber Export Prize for being one of the second largest companies within payments methods on the Dutch market. During Klarna’s vast growth in the past two years, the company has been granted a full banking license enabling the possibility to broaden its product portfolio for customers and merchants. The recently announced partnership with PPRO Group allows eCommerce businesses to improve conversion rates and provide a fast and smooth checkout process across Sweden, Norway, Finland, Denmark, the Netherlands, Germany, Austria, and the United Kingdom. 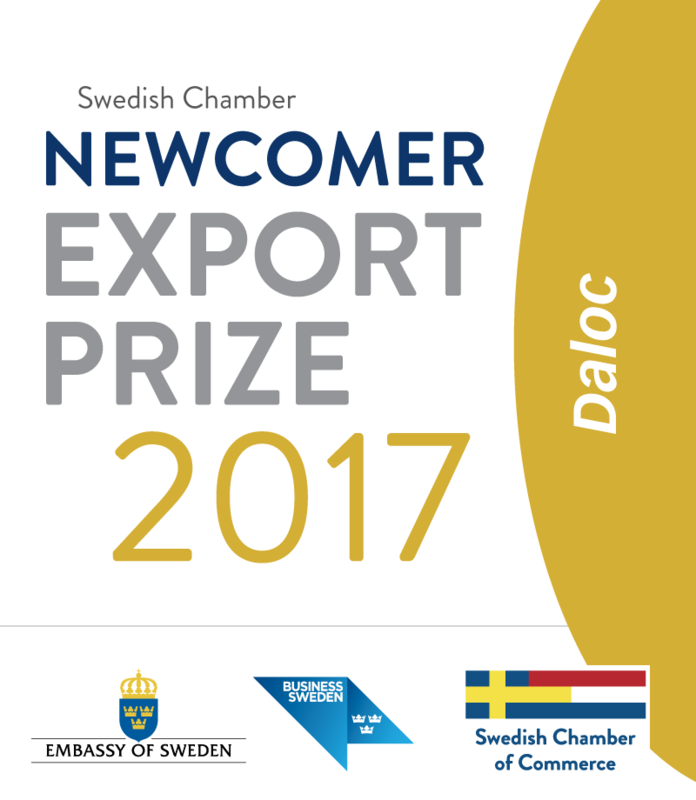 The Swedish Chamber of Commerce for the Netherlands, The Embassy of Sweden and Business Sweden were very proud reward the Swedish Chamber Export Prize 2017 in the category Newcomer, on December 15, 2017 to Daloc AB. The prize was handed out by H.E Ambassador of Sweden Mr. Per Holmström to Mr. Fredrik Silverstrand, CEO, Daloc AB. The Swedish Chamber Export Prize aims to strengthen the Swedish Dutch business relations and has been awarded since 2012 to Swedish related companies in the Netherlands. Daloc AB represented in the Netherlands has been awarded the Swedish Chamber Export Prize for their innovative and sustainable products and productions methods that are carefully selected to support a strong and ecologically sustainable society. Daloc’s products meet the customer’s requirements in terms of function and environmental aspects. Designs and manufacturing methods are selected to minimize the impact on the environment. Daloc has found a first-mover advantage in the Dutch market with their home Security Doorsets that remains airtightness much longer than wooden doors and therefore causes a massive energy win over a longer period of time.